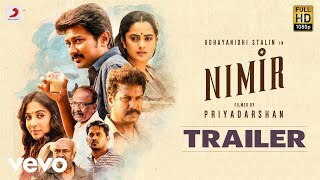 Nimir is a 2018 Tamil comedy-drama film directed by Priyadarshan. The film is produced by Santhosh T Kuruvilla under the banner Moonshot Entertainment. It features Udhayanidhi Stalin, Namitha Pramod, and Parvati Nair in the lead roles. Music of the film is composed by Darbuka Siva and B Ajaneesh Loknath with lyrics written by Thamarai.